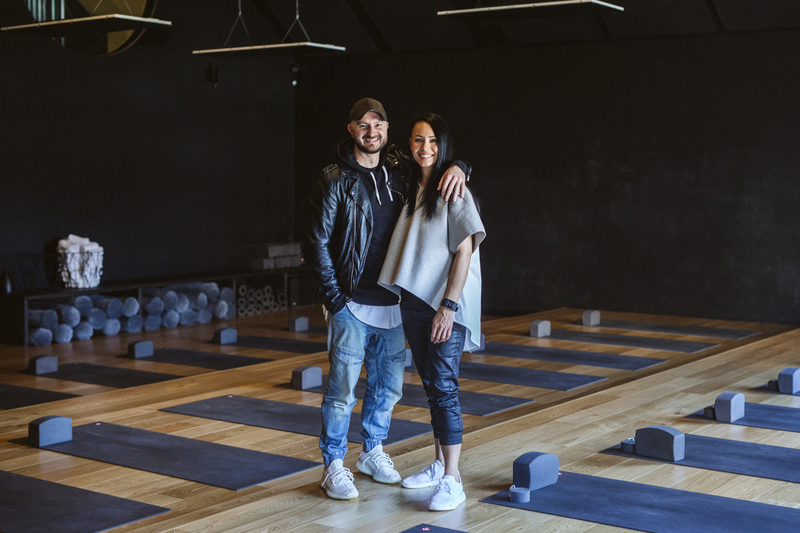 Not long after they started dating, Jackie Alexander and Chris Koch decided to extend their partnership into the yoga business by launching Humming Puppy. Five years later, the couple has studios in Melbourne and Sydney, Australia and is opening a third location in New York City. What sets Humming Puppy apart from other yoga studios is that classes literally ‘hum’ which, of course, is completely intentional. The studio space is injected with a combination of frequencies to enhance and deepen every yogi’s experience. Alexander and Koch also wanted their studios to be welcoming and playful so the idea of a puppy (or a downward dog) was born. The couple lives in Melbourne with two French Bulldogs, siblings named Harvey Spector and Khaleesi. We asked Alexander what it’s like to juggle their relationship with their business and what the couple has learned along the way. How long have you and Chris been together and how long have you been business partners? Chris and I have been together for 4 years and were friends for 5 years prior to being in a relationship. Humming Puppy was conceived over a cheesy, unintended Valentine’s Day dinner on the February 2, 2013 and while the opportunity to work together happened upon us early in our relationship we both knew it was right and something that we couldn’t ignore. Humming Puppy began in Melbourne. What inspired you and Chris to open the studio? Humming Puppy was initially inspired by my desire to work at a job that fulfilled me on a daily basis. I had been working in the dental industry managing practices for 10 years and was fortunate to work with dentists who loved their jobs. Being surrounded by these passionate people on a daily basis motivated me to undertake my teacher training with the view to leave my job, open my own studio and follow my dreams. Coupled with that was my love for yoga and the way it made me feel. I wanted everyone to know the true beauty of yoga and to experience the depths of the practice in the same why I had. I wanted everyone to know the true beauty of yoga and to experience the depths of the practice in the same why I had. Inspiring beginners along their yoga journey was also a key factor in the creation of the studios and as such, much of the Humming Puppy experience was designed with the beginner in mind. What was it like working together to get your first studio off the ground? Working together has been incredible from the beginning. We are extremely fortunate that we both have the same values and that our vision for the studio is perfectly aligned. However, while Chris and I are very much in sync we also don’t always agree and in those instances, we create space for each other’s ideas to be heard and ultimately find we always get to where we want to go in the end. You’re managing studios in Melbourne and Sydney and opening a third in NYC. Has one of you had to travel a ton? Yes! I’ve been the one who has had to travel between home (Melbourne) and the next new studio and while it can be hard sometimes not having Chris beside me to bounce ideas and thoughts off instantly I have loved the experience of living in each city during the construction and opening phase. It gives me an opportunity to accurately transfer our vision, hire the right people, build lasting relationships with the team and support the studio in creating an authentic Humming Puppy experience. What have been the best and most challenging parts about working together? The best thing is the shared experience of what we have created together. It’s extremely humbling to know that Humming Puppy has had such a positive effect on the lives of not only our students but also our teams and that together we have been able to create a safe space for people to reconnect to themselves. The hardest part is working across two time zones, not being able to instantly talk through things as they arise and not being able to download and debrief on the day’s events. This just means we have to be much more organized (which is not a bad thing) when we do talk and I find it actually makes us appreciate and value the time we have much more. How do you work together to juggle the demands of the studios with home life? Chris and I have always had very different routines. Chris is a night owl and I’m a morning person. This becomes amplified if I’m teaching and working early mornings or at the studio late nights. Often, we might take a class together at the studio to allow us both time to unwind yet still have a shared experience in each other’s company. When the demand of our time is high, we create space for us and don’t compromise our time by overcommitting ourselves. When the demand of our time is high it’s important to us that we create space for us and that we don’t compromise our time by overcommitting ourselves to conserve our energy and honor the time we need together as a couple. How do you manage to invest in your Australian business and your relationship while working in a location that’s 16 hours behind? Ensuring that my teams back home feel supported is very important to me and as a relatively new start up (that is spreading its wings globally) we are always looking at new ways to ensure that everyone feels heard, supported and connected to each other. It has meant we have had to empower and trust our teams to make the right decisions without them having to come to us for everything. When I’m home I spend as much time as possible in each studio working alongside our people, teamed with regular monthly management meetings to review how things are progressing and ensuring my teams feel secure in knowing I am there for them whenever they need me. I have to say I trust my teams back home implicitly. For Chris and I, we make sure we speak over FaceTime often and that we pre-plan his visits so that we have those to look forward to. The experience of what we are creating is a once in a life-time opportunity and reminding ourselves of that helps to keep us grounded and in the moment. What’s the one thing you wish you’d have known about running and growing a yoga business with your partner? I guess no one tells you just how much admin there is going to be and that there will be times when you are drowning in the admin and you’ll wonder why you did this in the first place! It’s something you can’t avoid but delegation is life changing and learning to let go of having to do everything yourself is also something you need to learn. What’s your best piece of advice for couples looking to do what you did in the fitness studio space? The best piece of advice I could give is to make sure your values and your vision for the business is aligned. I’ve seen partnerships where it isn’t and it’s a daily struggle that zaps time, energy and the passion you once had for your idea. Image courtesy of Alice from Mavis Jean Photography.